Got some leftover event budget to spend on more event tech? We have some seriously genius ideas to help you out (if we do say so ourselves). Rid the world (and your attendees) or boring content and make your sessions, workshops or panels more engaging. Add an extra level of interactivity to your event by using audience engagement apps. And before you roll your eyes, we don't mean adding another app just to have one (and maybe crash your wifi while everyone's downloading it). Our friends over at Glisser, for example, have built the industry's most sophisticated, yet easy to use web-based live slide sharing and Q&A solution in our industry. It's easy as pie and allows delegates to tune in to presentations, ask questions, answer polls, make digital notes, live tweet slides & much more. Tools like Glisser let you capture what's really on your delegates' minds, and the data you get in the process can be super useful for your future content programs. It's a win/win, if you will. Audience engagement apps don't have to be expensive. In fact, they often tie in with your event reg provider and plans can start at a couple of hundred dollars or less. Not sure your audience will love it? Try it out on a smaller event, then bring it to scale. Keep an eye on your engagement the first time to see if it's a product that works for your customers. 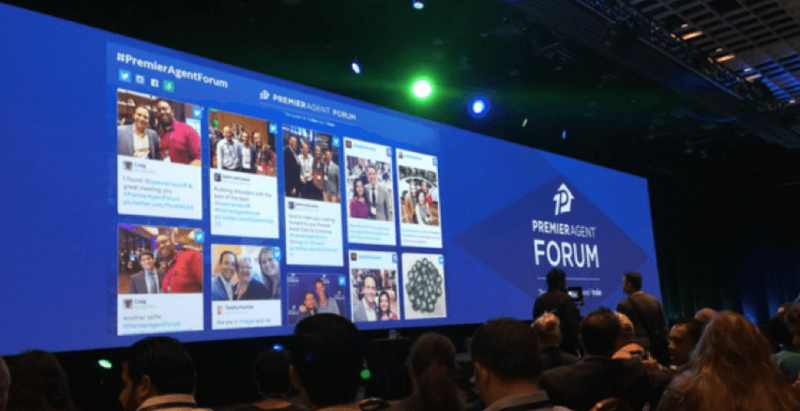 Social walls help bridge the gap between online and IRL at your event. They automate collecting social media posts from your attendees and displaying them prominently on a social wall at your venue. You can also manually select hashtags, or moderate the posts that come in. Let's face it— who doesn't love seeing their post highlighted on the big screen. Walls.io, #tagboard & Postano are just a few providers offering social walls at decent prices. Some of them even have free plans to get you started. By now you probably have a dedicated event website in place, one that showcases your event venue, event location, agenda and speakers— right? But honestly, on a scale from 1 - 10, how kickass is your website in helping you spark interest and encourage registrations? There are good looking event websites and then there are awesome looking event websites. What if you opted in for the latter? You could even invest in a custom-coded website theme that makes your brand really stand out from the crowd. Going bespoke ultimately saves you time in the long-run, and ensures all of your dedicated event landing pages are fully on brand. Give your potential registrants and attendees the unique attention and experience they deserve by using event personalization techniques and tools. It will not only increase the attention span of visitors, but also boost the engagement. Imagine watching your bounce rate drop. If you're not using Swoogo (bummer), which has awesome built-in personalization & event marketing features, another helpful tool is Unless. Unless helps you segment your audience based on location, time or a specific ad campaign easily and then change the messaging on your website accordingly. For instance, if you have a site visitor from Germany, you can greet them with a "Guten Tag" or "Hallo" instead of the standard English fare. Simple differences like replacing headlines or personalizing you call-to-action can make all the difference, and your audience can tell if you're making the effort. You've seen them before. Seriously, they're EVERYWHERE this year. With a little creativity and a true understanding of your attendees and target audience, you can create pretty cool chatbots in very little time. A chatbot can help you pre-event by answering most common questions, taking some of the burden off your support team. If someone has a question about the venue location, for instance, you can pre-populate answers and guide people to the right spot on your event website. And it doesn't have to sound robotic— with great copy and an ear towards normal human interaction, you can make a date with your bot just as warm and fuzzy as having an actual person on call. Here's a case study about how Bizbash used an event bot to improve the logistical support for the event. The best part? Chatbots work for you 24/7 and are pretty d*mn cost effective. One of the best suppliers of event-industry specific chatbots is EventBots by Sciensio. Check them out! Retargeting is one of the best tools for converting your existing event website visitors into registrants. It has been around in the digital world forever, but we're slowly seeing more and more event professionals running those campaigns to increase conversions. Your event registration page is your "shopping cart" equivalent, right? But here's the problem. Most people won't register on the first visit. There could be a million reasons why, but it's crucial to not let them off the hook! That being said, visiting a registration page shows clear intent to attend your event. So why not spend a little of that extra dosh on setting up a re-targeting campaign directed towards people who visited the page, but haven't completed it. We have more friends over at Feathr who are really good with those campaigns and run awesome educational content on the topic as well. Video is an effective way to drive awareness of your event and boost attendance. According to a study from Search Engine Journal, video is predicted to account for 79% of global internet traffic by 2020. Using video before the event helps you generate enthusiasm not only for those on the fence about registering, but also for people who have already purchased a ticket. Take one minute to check out the MozCon 2018's Pre-Event video. Makes you want to be a part of it, right? Video production can be expensive, but there are cheaper options too that don't necessarily look less professional. You can get a head start by leveraging your video testimonial footage from past conferences and creating a short showreel to display on your event landing page. Alternatively, you can use a tool like Rocketium help you to take your existing footage, like interviews, B-Roll or images, and turn it into nice bite-sized video snippets in literally no time. There is no better feeling in the world than finding an outlet when your phone is on 1% battery. Seriously. It's science. Conference attendees rely on their iPads, iPhones and other devices to check their emails, live tweet conference or chat with coworkers. Be their oasis in the desert. Get a mobile charging station or phone locker for stranded conference goers to use. You'll be a total hero, and you can bring in even more cash by selling the ad space on them to sponsors. Genius scheme, am I right? Do the venues you work with charge ridiculous Wifi rates? More likely than not, after you've shelled out a million dollars and the soul of your firstborn, you're still working with bandwidth issues and pissed attendees. Luckily, there's a solution: portable internet hotspots like the Karma Hotspot. These mobile hot spots are puck-size objects that you can rent, borrow or buy that create or extend the internet connection in the surrounding area. They are available for a couple of hundred bucks, and totally put an end to that "sorry I haven't checked my email in 9 hours I was at a conference" feeling.